patio graffiti, originally uploaded by chronic-shock. 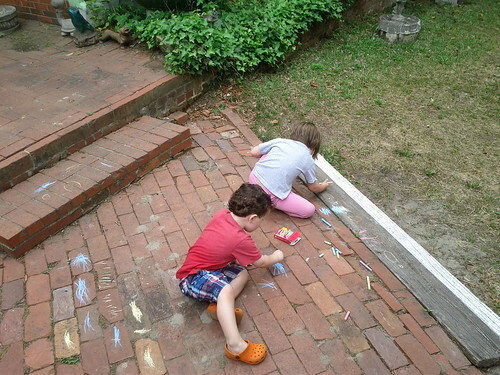 Quinn and Fletch being creative with sidewalk chalk. Time to Head Out Baby! I, the Landlord (Mommy), am issuing a notice for EVICTION. 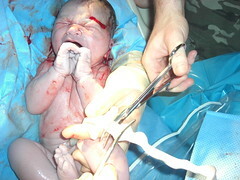 Tenant (Baby) will have to comply and promptly vacate the premises, or wait until authorization for removal by physician. After which, he will be removed from the property by induction. The Tenant (Baby) is being evicted due to breach of contract and destruction of property. Expansions only to the FRONT of the house, within reasonable limits, were discussed. Not only have these limits been exceeded, but additions to the back and sides of the house were also made without approval from the Landlord (Mommy). Remodeling and gutting of the home was never approved, nor was changing the initial layout and base structure. Due to the damage by the Tenant (Baby), the foundation has been compromised, and the structural integrity of the house is questionable. The Landlord (Mommy) has also received numerous complaints about frequent nightly disturbances. If the Tenant (Baby) doesn’t comply with the notice it will result in an immediate and forceful removal at the discretion of a physician and the Landlord (Mommy). Seriously...the nightly disturbances are what's killing me! I'm trying to build my sleep reserves and it is just not happening. If it isn't a congested head, it's some weird night panic waking me up. At least when the kid is out, I'll be waking up for a less annoying reason like a poopy diaper or a late night snack. As of this Friday, he has 4 more weeks. So baby...consider yourself served! I know Easter has come and gone, but hopefully everyone had a joyous Easter Sunday! We celebrated the whole weekend. 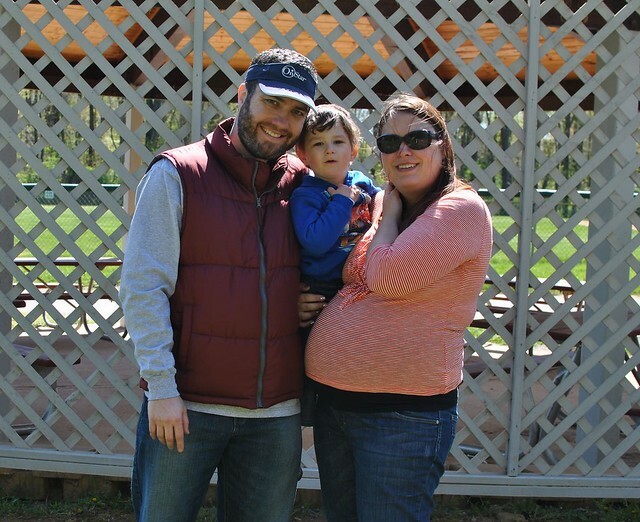 On Saturday we headed to Nottoway Park for an Easter Egg hunt for Fletch. 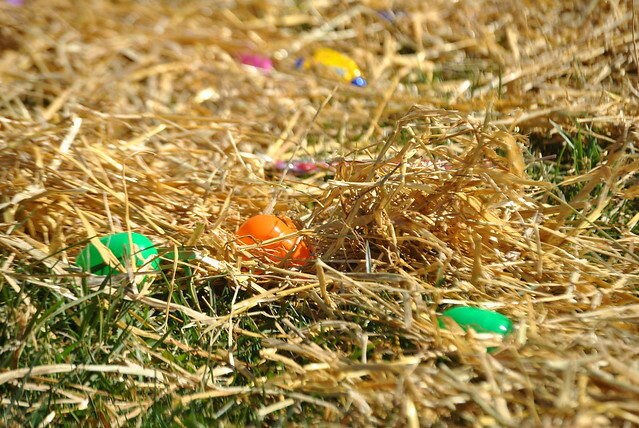 They sectioned off a big square of lawn and covered the ground with straw, then spread eggs and candy all over. 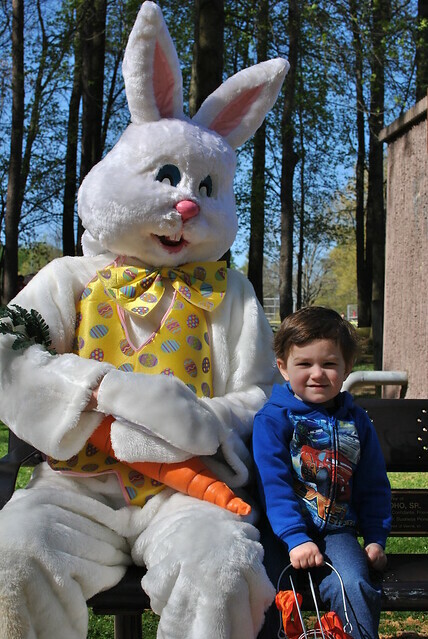 It was broken down by age group, so the 1-3 year olds had a fighting chance :) Before the hunt began, we got to take a picture with the Easter Bunny. 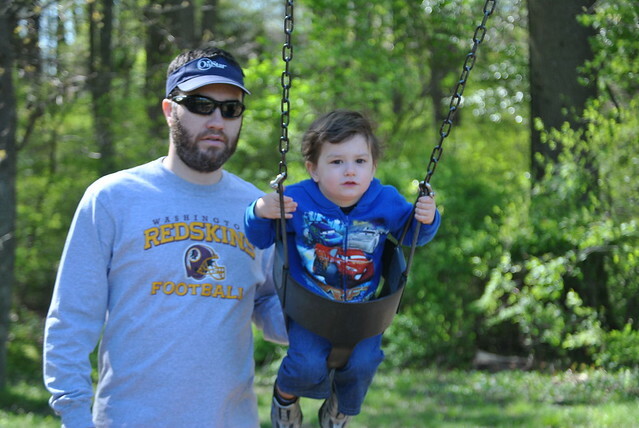 We had some free time before and after the hunt to take advantage of the playground and swings too. 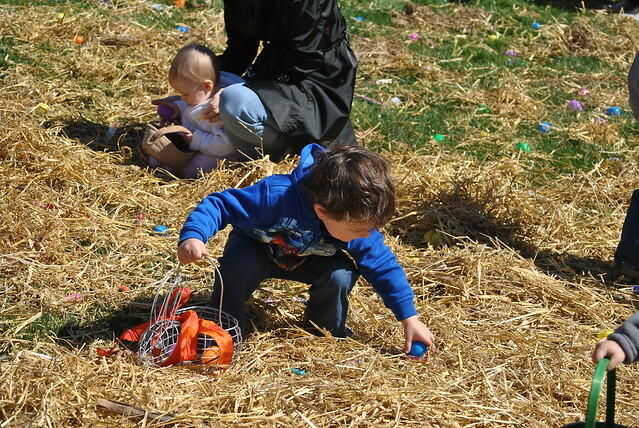 When the time came to hunt for eggs, Fletch was not a smash and grabber. 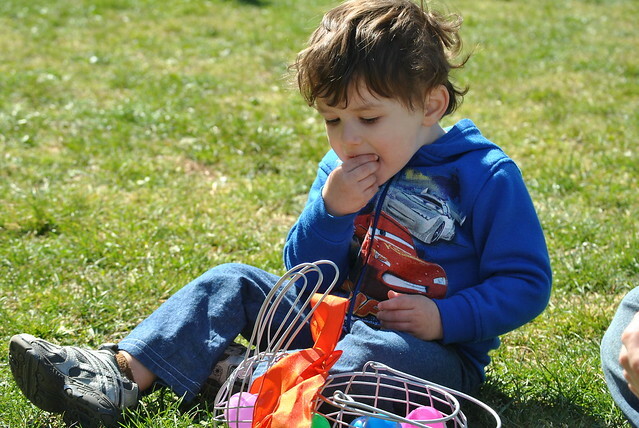 He took his time and picked up the eggs and put them in the basket. He was oblivious to the candy that was in plain sight. Each egg had a tootsie roll inside, so Fletch is a new fan of tootsie rolls. He did manage to pick up a few pieces of chocolate for Daddy. 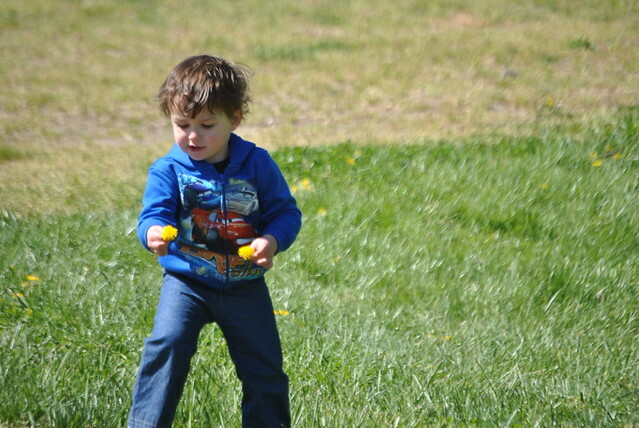 After the hunt we did some more playing at the playground and running around the park picking dandelion flowers. I found a good spot to place the camera so we could take a family pic. Look at the size of that belly! 34 weeks down and 6 to go! 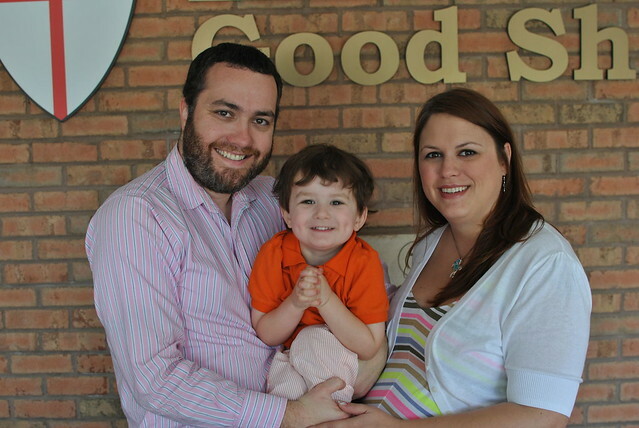 Sunday we went to mass at church and took a much better family picture. I made Fletch some orange seersucker pants for Easter. They came out so lovely! We were a very pastel and festively dressed family :) (Although my belly did look like a giant striped Easter egg.) After church we headed to brunch and we were even lucky enough to get Fletch to nap that afternoon, which meant I got to nap too! Hallelujah!